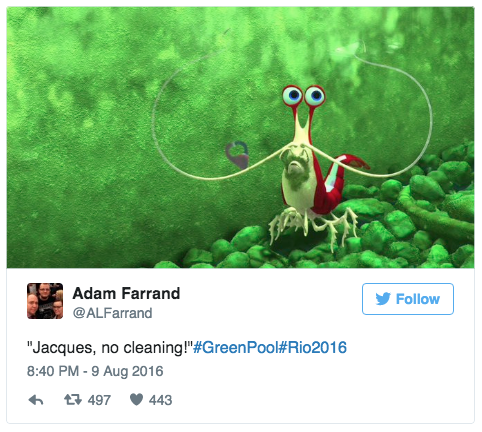 It’s not been a good start for the aquatic section of the Olympic games in Rio. A report commissioned by the Associated Press revealed that open water in Rio’s venues holds viral levels 1.7 million times what would be considered alarming in the United States and Europe. Then, one of the Olympic swimming pools used in the diving events slowly started turning a luminous shade of green, causing divers and spectators alike to become concerned. 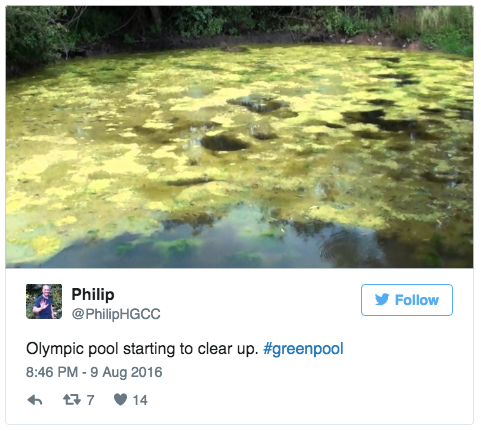 After people started to notice the pool’s bizarre colour, #greenpool started trending on Twitter. 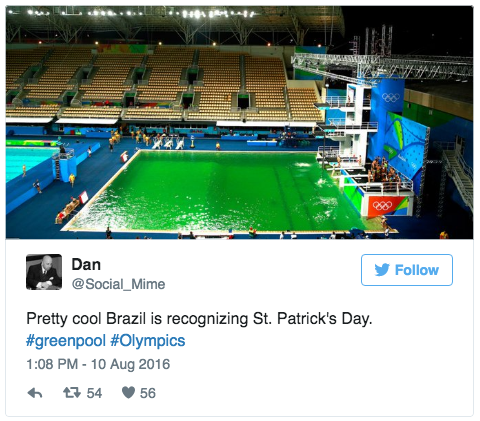 In fact, the green pool was so widely discussed that it should really have won a gold medal for the most famous pool at the Olympics. All the big names were talking about it and it saw more medals than Michael Phelps on a winning streak. Head over to the next page to see the divers’ reaction to the pool, and what the Olympic officials have eventually decided to do about it. After days of competition in the murky green water, Olympic officials finally decided to close the pool. While this is good news for all the athletes yet to compete, it’s not great news for those divers who have already been exposed to the water. 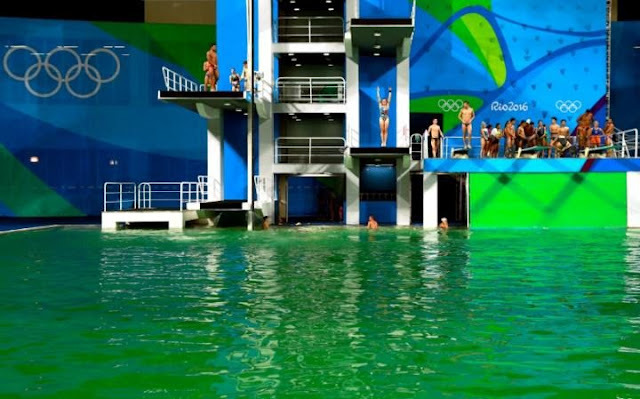 There is no word yet from Olympic officials as to what exactly caused the pool’s green colour, making athletes all the more concerned about having dived into the murky green depths. Of course, there has been one good thing to come out of all this, and that’s the internet memes. 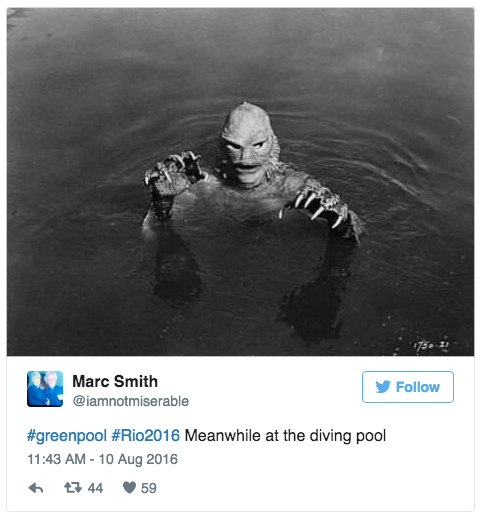 Ever since #greenpool began trending, a whole load of comedy gold has been mined from the laughter-factory that is Twitter. Head over to the next page to see some of the best. 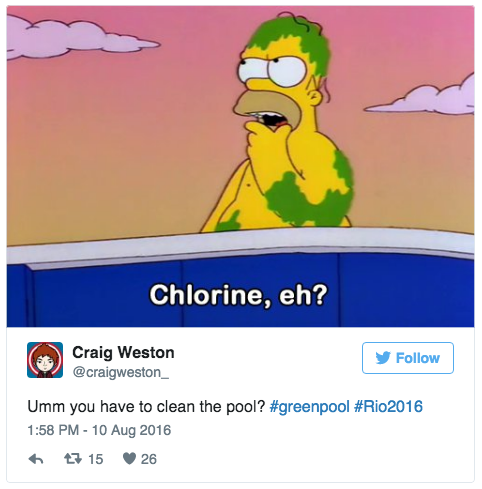 Never one to pass up a bit of schadenfreude, the people of Twitter were quick to make a mockery of Rio’s green pool fail. Below are just some of the very best responses, with a little help from Homer, Jaques and the luck of the Irish. Although the green pool is a slight distraction, let’s not get away from the real reason we all watch the diving: ogling at the athletes’ incredibly toned bodies. 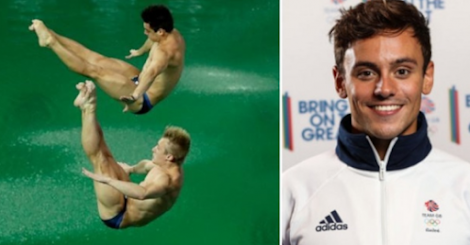 But don’t worry, because the internet has fallen for one British diver in particular, and I’d hate to be the one to stop you from looking at lots of photos of him sans clothes.